School has been in session a month and our community is buzzing with events of all kinds. Be sure to check out the City Events and if you are craft beer aficionado, there is the Lilburn Beer Fest this Saturday. Then we have the Car Cruise and Lilburn Daze following close behind. In this issue you will find information on Staged Right Community Theatre's production of "Wait" which will transform City Hall into a theatre venue. Also you will find several volunteer opportunities that are in organizational news items. Of note is the first ever clean-up of the Yellow River and a clean-up of the Wynne Russell House and Lilburn Post Office. Also look at the wonderful Opening Week events planned by the Lilburn Library Staff that will take place once the new Library/City Hall is officially open. We have made special note of a Young Professionals organization that is having their first anniversary social at Eagle Rock Brewery in Norcross. For small business owners, check out the Gwinnett Chamber's Small Business Boot Camp. Two of our faith organizations are having community activities: Salem Missionary Baptist Church is having a concert and BAPS Mandir will be celebrating Dwali, the Festival of Lights at the end of October. The Lilburn Arts Alliance is having some workshops and the Historical Committee is selling tickets to their Paranormal Investigation Fundraiser. And there's more - so take some time and look over the really fun things to do. Please forward on to new neighbors and business owners. Small Town Big World Festival 2016 was a wonderful event. 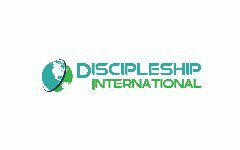 Thanks to the sponsors who made it possible: Nam Dae Mun, Mundo Hispanico, Vida Radio, First Baptist Lilburn, Discipleship International, Explore Gwinnett, BJ Pak, Agavero Cantina, Gwinnett Human Relations Commission, - see the sidebar for a sponsor listing. Thanks also to the volunteers who included Lilburn Police Department Explorers, Parkview HS MJROTC, Berkmar Beta Club, SafetySmart Lilburn and numerous community volunteers. Finally a big thank you to the City of Lilburn for co-sponsoring and providing promotional and staff support. All proceeds raised through sponsorships went toward event expenses. Have you ever wondered what it was like to be a paranormal investigator? Well now is your chance! 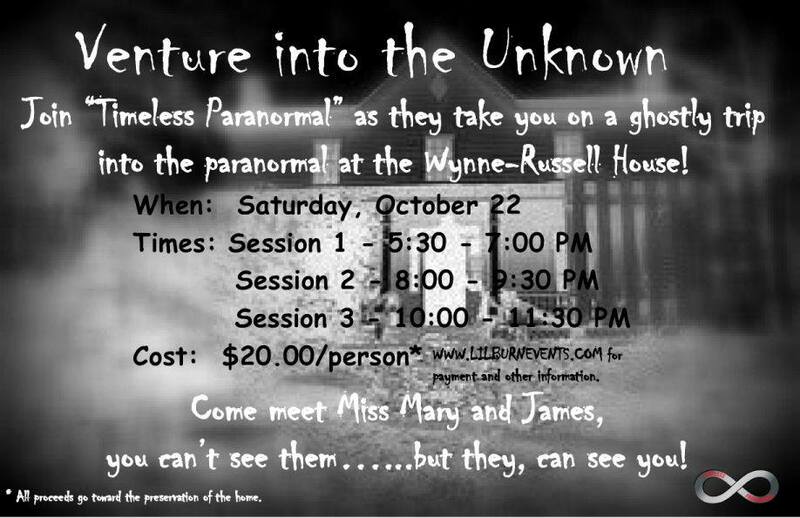 Timeless Paranormal, local paranormal investigators and convention speakers, will conduct their 2nd annual paranormal fundraiser at the Historic Wynne Russell House on October 22, 2016. The sessions have been changed to an hour and a half this year!!! This will be a ticketed event at $20 per person with advanced reservations required. Times will be 5:30 p.m., 8 p.m., and 10 p.m. There are only 8 spots per session and the event sold out quickly last year, so please visit http://www.lilburnevents.com/wynne-russell-tours-and-events.html to purchase tickets. In 2016 we had many children attend and Shannon & David make this a family friendly event, but please remember they will be discussing the paranormal, history and deaths of former residents when deciding if you want your children to attend. 100% of the ticket sales go to the preservation of the Wynne Russell house and we thank you for your support. There are several opportunities for volunteering: Staged Right is looking for volunteers to help greet attendees at their first production to be held at Lilburn City Hall Sept. 23-25 and 30-Oct. 2. Department of Water Resoucrces is holding its first ever Yellow River Clean-up this Saturday, Sept. 17. Wynne-Russell Historic Preservation Committee is holding a clean-up on Oct. 1 beginning at 9:00 am. 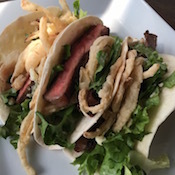 1910 Public House will launch their fall menu on September 19. Also, they would like you to come in to their tap room and sample any of their 28 craft brews on tap. Lastly, they are taking reservations for their private dining room which accommodates 75 for dining and 100 for cocktail/appetizer service. Contact Jtiveria@mac.com for info. 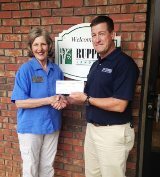 Steve Faber recently presented a donation of $1,000 to the Lilburn Community Partnership on behalf of Ruppert Landscape. The gift was a portion of the proceeds from the Reject Run held in July. The funds will help the LCP further its mission of fostering community spirit in Lilburn. Ruppert will also be making a donation to Lilburn Terrace. Thank you Ruppert Landscape for giving back to our community. 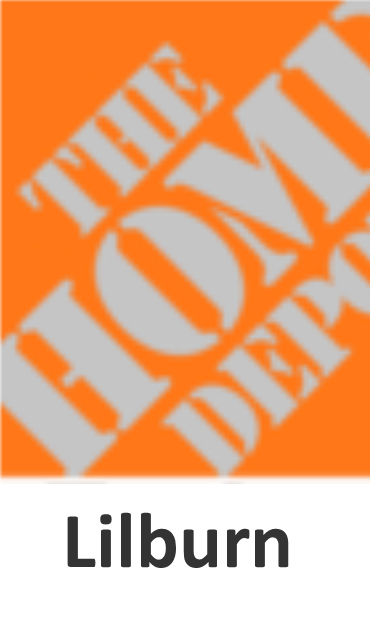 Small Business Professional Development Boot Camp - Thursday, Sept. 29, 8:00 am - 12:30 pm at the Universtiy of Geirogia Gwinnett Campus, 2530 Sever Rd. Suite 223 Lawrenceville GA 30043 - Sponsored by Gwinnett Chamber of Commerce, Registration $25 for non-members. Learn how to become more effective in the workplace and successful in life through communication, leadership and relationships. This highly-interactive three-session boot-camp provides in-depth lessons and a solid foundation to help you stay interested and interesting by effectively building your personal brand, becoming a successful leader and gaining an understanding of social and environmental factors that contribute to your individual success. Registration is now open, but limited to the first 100 registrants in order to facilitate intimate, personal instruction during our breakout sessions. New City Hall and Library opening soon! The new Lilburn City Hall and Gwinnett County Public Library at 340 Main St. will open its doors to the public following a ribbon cutting ceremony on Tuesday, Oct. 18 at 4 p.m. The public is welcome to attend the ribbon cutting. There will be another opportunity to tour the entire building during an open house on Saturday, Oct. 29, from 10 a.m. to noon. There will be some office closings as employees transition furniture and equipment to the new building. We apologize for any inconvenience. - Friday, Oct. 14 at 5 p.m.- The Planning and Economic Development Department will close its location at the Annex (98 First Ave.). All planning and permitting business will be conducted at the old City Hall (76 Main St.) until the new building opens to the public. - Monday, Oct. 17 at 12 p.m. - The old City Hall (76 Main St.) will close at noon. - Tuesday, Oct. 18 - City administrative offices will be closed for business, as computer systems and telephones are transferred and tested at the new building. - Wednesday, Oct. 19 at 8:30 a.m. - City offices will open for business at the new location at 340 Main St. 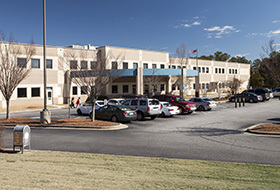 This is the first jointly owned city-county facility in Gwinnett. Click here to see photos and learn more about the project. Rent a bicycle on the Greenway! Bicycle rentals are available on the Camp Creek Greenway on weekends during September, October, and November. 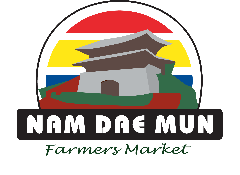 Hours are Saturday 10 a.m. – 6 p.m., and Sunday 12 p.m. – 6 p.m. The last rental of the day is at 5 p.m. The rental trailer is located at the trail entrance to Lilburn City Park, 76 Main St. Adult bicycles cost $5 per hour, and kids are $5 all day. Tow-behinds and tandem bikes are also available. In case of inclement weather, call 770-638-2236 or visit the Camp Creek Greenway page on Facebook to find out if rentals are available. Atlanta Beer Festivals and the City of Lilburn will host the first Lilburn Beer Fest in the shady pavilion area of Lilburn City Park. Come and sample some of the 100+ Beers, and enjoy live music, and food. Tickets: $40 after Sept. 9, $50 day of event. Tickets on sale at Lilburnbeerfest.com. This is a 21 and up event, no kids, no babies, no pets. rain or shine, no refunds. Designated Driver tickets will be available for $15 at the gate. We will have free bottled water. Alcohol will cut off at 6:45 p.m.
Join the City of Lilburn and Southeast Wheels Events for Classic Cars in the Park! Cars, trucks, and motorcycles of all makes and models to be parked on the lawn in the beautiful Lilburn City Park! Visit with vendors. Concessions available. Free admission for spectators. A 50/50 raffle will be conducting during the event, benefiting Pets for Vets. Vehicle registration fee is $15, day of the event. All years, makes, and models are welcome. For more information, email Mike Thies or call 770-883-0160. Entertainment at the band shell provided by Gemini 13. Food concessions: Hot Dog Ninja and Bruster's yummy ice cream! The Lilburn Daze Arts and Crafts Festival is right around the corner. This year's event will be held on October 8 at The Lilburn City Park. A Lilburn tradition for over forty years, Lilburn Daze features more than 150 arts and crafts vendors, a variety of food vendors and a kid zone featuring free art activities, a train ride, pony rides and lots of other fun for the children. We look forward to having a lot of our favorite vendors returning this year including food trucks, many new crafters and an expanded children's area. Come to find your favorite jewelry, pottery, baskets, wire sculpture, bottle art, wood Adirondack chairs and much more!! Don't forget to stop by the Boy Scouts booth for your kettle corn! Hosted by the Lilburn Woman's Club and co-sponsored by the City of Lilburn. Visit www.lilburndaze.org for more information. Enjoy dinner and music in the park! Sample a variety of food trucks and local bands. 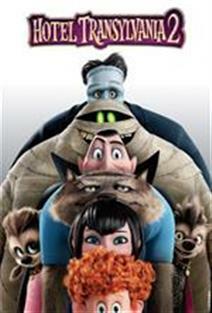 Bring your blanket or lawn chair and watch Hotel Transylvania 2 in the park! Concessions will be available. Kids are encouraged to wear their costumes. Movie will begin at dusk. Council Meeting - Oct. 10, 6:30 pm Work Session followed by 7:30 pm Meeting Click HERE for agenda and minutes of meetings. Diwali, the festival of lights, one of the most auspicious days in the Hindu calendar is celebrated with great devotion and splendor every year. On this festive occasion, BAPS Shri Swaminarayan Mandir - Atlanta coordinately invites you, your family and friends to celebrate Diwali, the festival of lights, on Sunday, October 30, 2016. 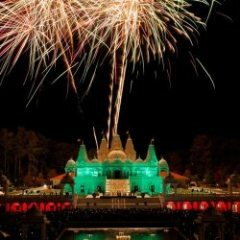 Open to one and all, the celebration is an opportunity to enjoy the spectacular fireworks, traditions, and rich culture of the Hindu faith. For 36 years and counting, Gwinnett Clean & Beautiful has been a community-focused, volunteer-led nonprofit organization based in Gwinnett County – and for 30 of those years, Connie Wiggins has served at the helm of our organization as Executive Director. Shortly after announcing her retirement in early 2016, our Board of Directors launched a search to find Connie’s successor – not an easy task with such big shoes to fill. We are proud to announce that the search has come to an end as we welcome Schelly Marlatt as Gwinnett Clean & Beautiful’s new Executive Director. With the addition of Schelly also comes the news of a move from Gwinnett Clean & Beautiful’s current facilities in Duluth to a new location at 446 W Crogan Street, Suite 225 in the heart of Lawrenceville, adjacent to the Justice and Administration Building. Our focus on environmental stewardship and education programs like Adopt-A-Road, Adopt-A-Stream, litter and graffiti prevention, waste reduction and recycling awareness, and community events paired with our passionate pursuit to make Gwinnett the “cleanest, greenest, most livable community in the United States” remains unchanged. 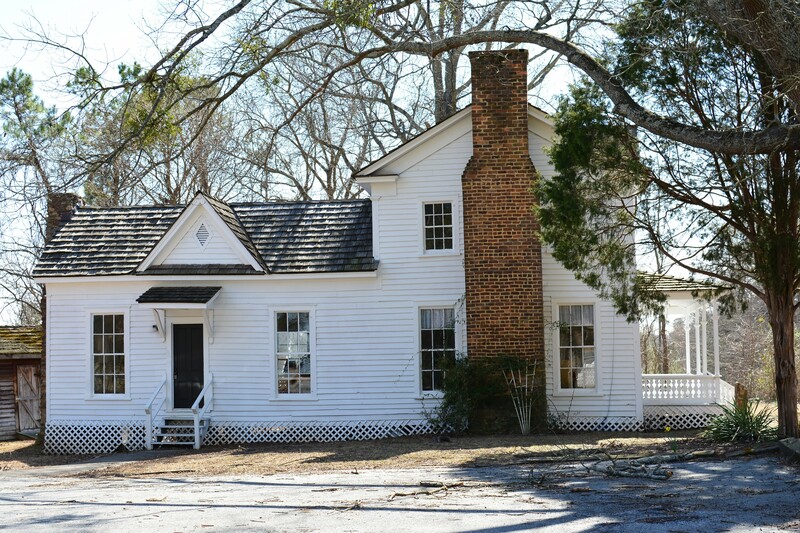 The Environmental and Heritage Center (EHC) plans to take guests back in time to the mid-1800s with its living history event at the historic Yellow River Post Office at Hudson - Nash Farm in Lilburn, Ga., on Saturday, Sept. 24 from 10 a.m. until 4 p.m.
Immerse yourself in life on the home front in the 1860s. 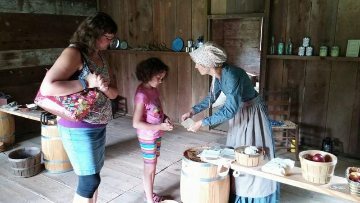 See a laundress demonstrate how clothing was cleaned, meet a soldier, participate in mock drills, gain an appreciation for period music and learn of the contributions made by local residents Thomas P. Hudson and Eli P. Landers. Tour the historic post office and general store to understand how this location provided critical supplies to the local population. Visitors will also explore the cultural contributions of African-Americans during this time in history through an interpretation of the slave cabin that is located on the site. Program fees for the event are $8.00 per person. EHC members and children two and under are free. Guests are encouraged to pre-register online atwww.gwinnettEHC.org or pay at the gate the day of the event. Event parking is not available at the Yellow River Post Office. Guests should park at Maranatha Baptist Church (3340 Five Forks Trickum Road, Lilburn, Ga.) where a shuttle will be available to take them to the Yellow River Post Office. For more information about this event, visit www.gwinnettEHC.org. Join us for our One Year Anniversary Bash Tuesday, Sept. 20 from 5:30 pm - 7:30 pm at Eagle Rock Distributing Company, 6205-A Best Friend Road, Norcross 30071. All young professionals are invited! Gwinnett Young Professionals brings together the best and the brightest from across the region for one exciting night on the town. Become engaged with other young leaders through social connections and professional development opportunities. On October 15, Instructor Peggy Sullens will lead an oil painting workshop from 10:00 am -1:00 pm. Please check our website www.lilburnartsalliance.org for sign-up details and more information. Space is limited, so please sign up early. Look for the Lilburn Arts Alliance booth at Lilburn Daze, Saturday, October 8th, from 9am to 5PM. Stop by and see new art from our amazing artists. Workshops and meetings are held at the Wynne Russell House (4685 Wynne Russell Drive, NW, Lilburn, GA 30047). Please check our Facebook page for updates,https://www.facebook.com/LilburnArtsAlliance. Guests are always welcome. Beginning at the September Luncheon there will be a meeting fee ($10 - members, $15 - non-members) that can be prepaid online or at the meeting (cash, check or charge). The fee will include your meal, drink and tip. There is no discount if you chose not to eat. This only applies to the luncheon. Register and Prepay (not required, but it is nice to know you are coming). Additionally, Business Builders Breakfast meets at IHop on the first Friday of the month at 8:00 am (Friday, Oct. 7). For more information visit their Web site. The Lions have been busy serving the Lilburn Community. They had booths at National Night Out and Small Town Big World Festival. They are now kicking off their annual Pecan Fundraiser. Lions will be doing vision screenings at two health fairs later this month and in October. In October they will conduct a Peace Poster contest in one of the middle schools. 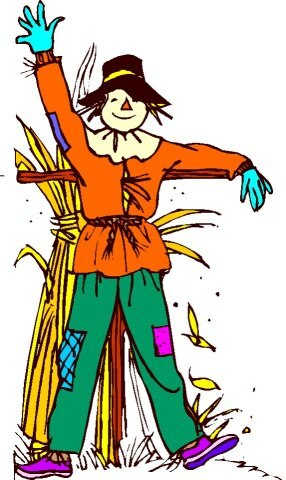 On Saturday, Oct. 8 at 8 am, they will do a road clean-up on Rockbridge Rd. The Lilburn Lions Club meets on the second Thursday of the month at noon at Taste of Paradise restaurant. The next meeeting is . The next meeting is October 13 and visitors are welcome. Contact President Derrick Weaver at 770-377-9523 or Danny Taylor at 770-925-0300 for contact information. The Lilburn Woman's Club is making plans for a great 43rd annual Lilburn Daze on Oct. 8 and invites the community to come out and spend the day at Liliburn Park. The Conservation Department is planning a clean-up at the Lilburn Post Office on Saturday, Sept. 17 beginning at 9:00 am. Next week the Education Department will be helping at Arcado Elementary's Grandparent Appreciation Day and club members are volunteering at the Health Fair at Our Lady of the Americas Church. The next general meeting is Thursday, October 6 at 7:00 pm at Calvary Baptist Church. Visitors are welcome. Fall is a great time to get to know your neighbors. The weather is cooling down and yard work forces everyone to be outside. It is also a great time from a neighborhood block party. While interacting with your next door neighbors, why not talk about starting a watch group for your area? Neighborhood watch can be very formal or very informal, depending on the wishes of the group. Some subdivisions meet once a year, others have monthly meetings. The main goal is to KNOW YOUR NEIGHBORS and communicate what is going on. Communicating suspicious activity to local police helps to serve as the eyes and ears of the community. Subdivisions within the Lilburn City limits have the benefit of support from Lilburn Police Department. Those in unincorporated Gwinnett County have support from Gwinnett Police. In either case, SafetySmart Lilburn can help with the initial process of getting a watch started. There are a few simple steps to establish contact with residents in the area and then one person can handle communications. SafetySmart partners with both police departments to encourage neighborhood watch formation to increase safety in the greater Lilburn area. For more information, send an email to info@safetysmartlilburn.org or visit the SafetySmartLilburn.org website and complete a request form. The community is invited to and outdoor concert to help Salem Missionary Baptist Church, established in 1834 celebrate its 182nd Anniversary. There will be a free cookout, youth/children’s activities, and live music of all kinds: praise and worship, gospel, gospel jazz, gospel rap, Christian, and Christian pop. Bring your lawn chairs and umbrellas. The festivities will be held on the church grounds located at Church St. and Killian Hill Rd. on Saturday, October 1 from 12:00 pm until 5:00 pm. Staged Right Production of "Wait"
Art imitates life imitates art! In Julie Jensen’s hilarious play “Wait!”, we meet Wendy Burger at the very moment that she begins to meet herself. Swept along in her best friend’s plans to open his very own theatre, despite all the quirks and oddities that come with the territory, Wendy finds herself in that split second “between the question and the answer.” “Wait!” uses the theatre experience itself as a framework for this moment in Wendy’s life, making it the perfect show to kick off the first season for Lilburn’s very own Staged Right Theatre. Local actor Marie Violette steps into Wendy’s boots for her very first lead role in a community theatre production. Playing a character in transition comes with its own unique set of challenges, of which Violette says, "Wendy is by far the most different character I've ever been. Becoming her has been like getting to know the new girl at school; just when you think you know her, you learn something new. It's been fun." Heather Kapp, who has recently returned to the area and to the local community theatre scene, plays O Vixen My Vixen! (yes, that’s her name . . .), an aspiring actor who brings a strange sort of music into Wendy’s life. Linda Marie Johnson and Joshua Howe inhabit multiple roles over the course of the show, representing Wendy’s memories of the characters who played maternal and paternal roles in her life. Johnson brings to life Modesto, a love interest of Wendy’s dad; Floating Piñata Head, an actress who has a thing or two to teach Wendy; and Jen-ya, the motherly neighbor who embraces Wendy with produce. Howe, on the other hand, appears as Wendy’s Dad, her neighbor Hazar, and her best friend Lu. While Hazar is Wendy’s rock and Dad is Wendy’s burden, Lu’s theatrical passions and dramatic personality sweep Wendy off of her well-worn path and sets in motion the events that interrupt the flow of Wendy’s life. Behind the scenes, local talent has come together to help create the show. Philip Wray will be designing lights, Lisa Croteau will be designing costumes, and local award-winning broadcaster Scott Piehler is lending his talent to sound design. Directed by Staged Right’s Artistic Director, Starshine Stanfield, “Wait!” marks the first official show in Staged Right’s inaugural season and will be presented in the Lilburn City Hall auditorium. Previously, the theatre has hosted two “Theatre Under The Stars” fundraisers, presenting the Pulitzer-prize winning “Talley’s Folly” by Lanford Wilson last September, and the beloved “Jerry Finnegan’s Sister” by Jack Neary in July of this year. Staged Right is a non-profit 501(c)(3) organization operating out of Lilburn, GA. The mission of Staged Right Theatre is to bring theatre to the community, and to bring the community to theatre. Our purpose is to develop and nurture diverse talent in a safe environment while performing community outreach through quality theatre and service to the community. When: September 23-October 2. Fridays & Saturdays at 8:00 pm, Sundays at 2:30 pm. 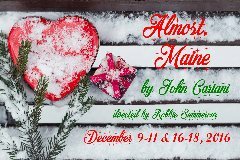 Staged Right Theatre is holding open auditions for Almost, Maine by John Cariani, directed by Robbie Summerour. Performances will be December 9-11 and 16-17, 2016. All roles are volunteer, unpaid. Audition Dates: October 4th & 5th, 7:00 pm - 10:00 pm,Callbacks (by appointment only) October 8th 5:00 pm - 8:00 pm. Please prepare 2 contrasting monologues - 1 dramatic, 1 comedic - totaling no more than 90 seconds. Cold reads will also be conducted. Actors will need to show an ability to play multiple characters as well as the ability to generate romantic chemistry. Auditioners will be seen in groups at 7:00 pm, 8:00 pm, and 9:00 pm. Please plan to arrive on the hour - appointments recommended, but walk-ins accepted. The WRHPC meets the second Wednesday of the month at the Wynne-Russell House. The next meeting is Oct. 12 at 5:00 pm. 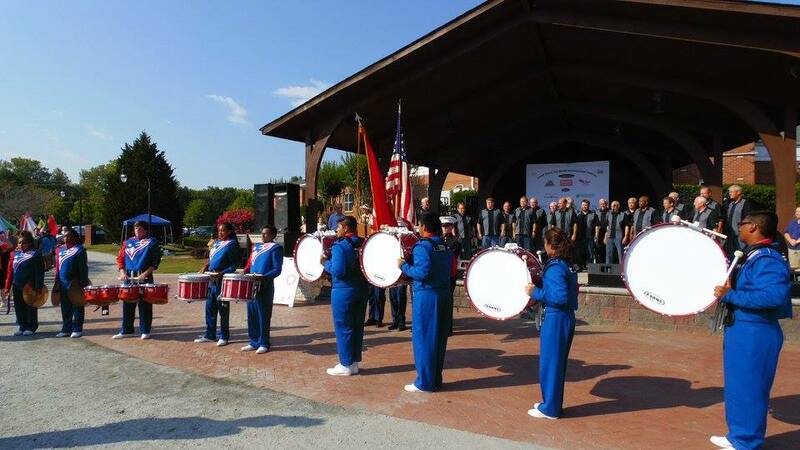 Berkmar did its part in making the recent Small Town Big World Festival a success. The Berkmar Marching Patriots once again rallied attendees to the Parade of Flags at Opening Ceremonies at the Small Town Big World. A team of twenty Beta Club volunteers helped during set-up and take-down. Finally, the French and Spanish Clubs provided a booth with children's cultural activities. Thank you to band Director Arthur Wright, French Club sponsor Tom Pickett and Beta Club sponsor Melissa Vitrano for organizing these three groups. Under the direction of Julian Gonzalez, Lilburn Middle School Orchestra students gave an outstanding performance at the Small Town Big World Festival. The students were also joined by some alumni who took time to once again play for Mr. Gonzalez. 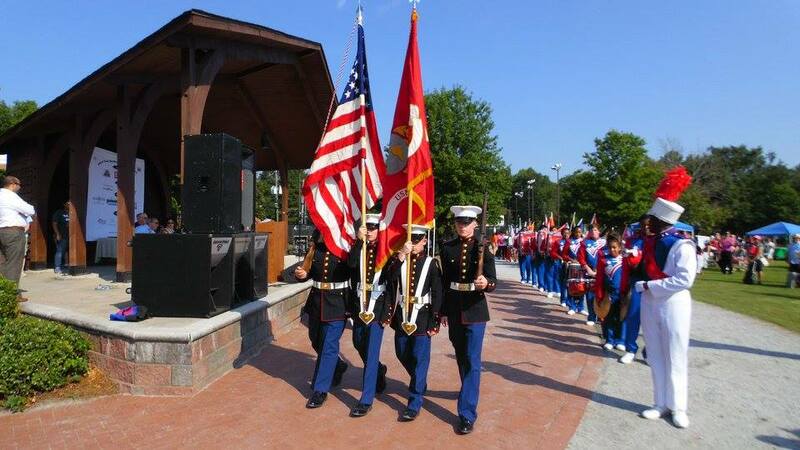 The Parkview MJROTC Color Guard showed their best during Opening Ceremonies at the Small Town Big World Festival on Saturday, Sept. 10. The Corps also provided volunteers for the event as well as for National Night Out Aug. 4. in setting up and taking down tents, tables and chairs. You will see them in action again setting up and taking down at the Lilburn Daze Festival on Oct. 8. Thank you Maj. Ron Tootle for your leadership in the character formation of these young adults. Students from Girl Up had a booth at the STBW festival and a group of students performed dances from Ethiopia. Thanks Parkview for these contributions to the Festival. The Sweetwater Middle School Chorus under the direction of Janet Montgomery entertained attendees at the Small Town Big World Festival. This is the second year the students have entertained at the festival. Rapid HIV Testing • FREE! Thursdays September 22 and October 27 from 6:00pm to 7:30pm. No needles. No appointment needed. Results in 20 minutes. Sponsored by AID Gwinnett. 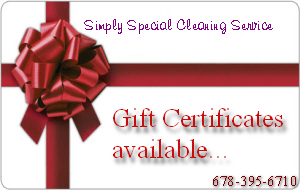 Call 678.990.6435 or visit RCClinc.org for more information. 24/7 Dad® Fathering Seminar • FREE! Wednesdays, September 21 to October 5 from 6:00pm to 8:00pm. Sponsored by the Healthy Families Initiative. Topics will cover family history, what it means to be a man, showing/handling feelings, men’s health, communication, the Father’s role, discipline, children’s growth, getting involved, working with Mom & co-parenting. Dinner will be provided. To register, please call 1.877.814.0535. 24/7 Dad® Seminario de Paternidad • GRATIS! If you're looking for a fun way to give back to the environment, join the Department of Water Resources for its first-ever Yellow River Trash Bash this weekend. The river cleanup is open to all ages and will be held Saturday, September 17 from 9:00am to 1:00pm. If you're one of the first 100 participants, you will receive a free t-shirt. The Gwinnett Extension Service wants you to take part in the 4-H farm experience at the big red barn while you're enjoying the fair. Gwinnett 4-H Clubs are presenting their Farm Friends exhibit this year with barnyard trivia, romping baby goats, and fresh milk from Mayfield Dairy. 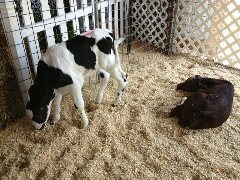 Kids can meet baby animals, celebrate Ellie Mae the donkey's birthday, and milk Daisy, the saw horse cow. The Gwinnett County Fair runs from September 15 to 25 at the Gwinnett County Fairgrounds, located at 2405 Sugarloaf Parkway in Lawrenceville. Are you looking to start your career or make a career change? Your next opportunity may be with Gwinnett County Government! Come to the 2016 Career Expo on Friday, September 23 from 9:00am to 3:00pm at the Gwinnett Justice and Administration Center, 75 Langley Drive in Lawrenceville. Meet face­-to-­face with department representatives and learn how you can kick start your career with Gwinnett County Government. The County offers rewarding job opportunities in many professions. Vacancies are currently listed online, so apply today at www.gwinnettcountyjobs.com. Wed.- Thu. October 19 & 20 Tours on the Hour of the new Lilburn Branch. See the new Lilburn Library through a guided tours provided by staff! Fri. October 21 Great Days of Service at Lilburn Middle School 10:30 am - 1:30 pm Students can learn about career opportunities through presentations by Gwinnett County Professionals. Sat. October 22 Spooky Fall Crafts Drop in Family 10:30 am - 12 pm Make your own Halloween craft to take home! Sun. October 23 It’s a Puppet Show! 2 pm & 3:30 pm Enjoy delightful stories through the magic of puppetry! Mon. October 24 2017 Changes in Medicare Workshop 11:00 am - 12 pm Explore upcoming changes to make the best decision about your 2017 coverage choice. Mon. October 24 Let's Talk 6:30 - 7:30 pm Practice Englsih in a comfortable conversational setting. Tues. October 25 Lilburn Seniors Blazing the Trail! 10:30 - 11:30 am Learn about library resources through library staff and enjoy special presentations. Wed. October 26 3D Printing Demonstration 3 - 4:30 pm See and practice 3D printing; take home your creation! Thu. October 27 Cubelets for Tweens Drop in Craft 6:00pm-7:30 pm Enjoy creating robots that have lights, sound and can move forward and backward! Sat. October 29 Field Day Fun and Games Outdoor Event! 2:30 pm - 4:00 pm. Come outside and join us for face painting, jump rope, water balloons, hula hoops and more! Sun. Oct. 30 Halloween Teen Program 3 pm Make Sugar Skulls and learn about the Mexican Holiday Dia de los Muertos. Mon. Oct. 31 Let's Talk 6:30 pm - 7:30 pm Practice English in a comfortable conversational setting! 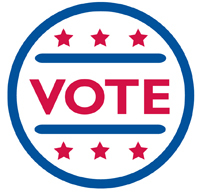 The general election will take place on Tuesday, November 8, so register to vote before the October 11 deadline. Visit the County's Voter Registration webpage to download an application or contact your local public library, public assistance office, recruitment office, schools, and other government offices for a mail-in registration form. You can also register to vote online or with your smartphone. Visit the Secretary of State's website for more information. The Gwinnett Voter Registrations and Elections Division still needs poll officials for upcoming elections so visit www.gwinnettcountyjobs.com to view the job posting and apply now. Want to raise money for your charity or program? The Gwinnett Voter Registrations and Elections Division's Adopt-a-Poll Program gives your organization an opportunity to serve your community while earning money for your cause. Visit the Adopt-a-Poll webpage for more details. If your organization or business would like to submit, send us your item in a Word document by September 30 for publishing around October 15.